The first missionaries to arrive in the islands were from New England. Sailing in the Thaddeus, 14 missionaries (seven mission couples) and four Hawaiian boys left Boston. They arrived in Hawai’i after 164 days. 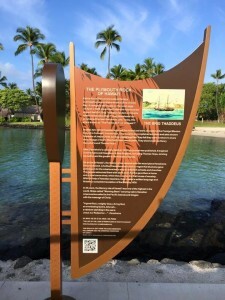 During the time they were at sea, Kamehameha I had died, his son Liholiho had become ruler, and the ancient kapu system had been abolished, with no belief system to take its place. THE NAME: There have been literal interpretations offered covering the name of Mokuaikaua. One is “The Trees Are Cut, Let Us Eat.” Another, “The Land the devours warfare.” The only acceptable origin of the name Mokuaikaua is due to the place where the timber material was obtained; it was part of the crown properties known as Mokuaikaua, and located on the western slopes of Mount Hualalai. 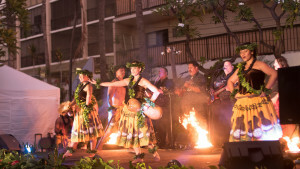 THE ARCHWAY: In 1910, the Evangelical Association of the territory of Hawaii met in Kailua to celebrate the 90th anniversary of the coming fo the first american congregational missionaries to Hawaii in 1820. 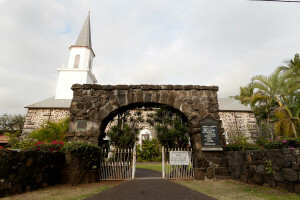 In honor of this occasion, Mokuaikaua Church was repaired and a stone arch was built to commemorate the anniversary. THE SANCTUARY: Two other structures were built prior to the present church. The first was built as the King’s home prior to 1820, and the second was built as a church in 1825. The present structure was started in 1835 and dedicated in early 1837. Church, St. Michael the Archangel Parish, Haili Congregational Church, Kuhio Chapel, Waipahu United Church of Christ, Gospel of Salvation Church, Kahikiola Congregational Church, Kona Church of God, Family Foundations International, Corinth Reformed Church, Rev. 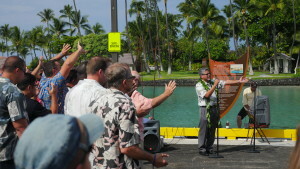 Abraham Akaka Ministries Foundation and the University of the Nations for their generosity.